ELC & Elementary School Sports Day Update! The students are all excited about the upcoming Sports Day. Let’s hope for the weather on the 29th! Parents please check the school website on Friday morning at 6:10. We will make the call to cancel on Friday by 6am in case of rain. If sports day is cancelled then we will have a regular school day. 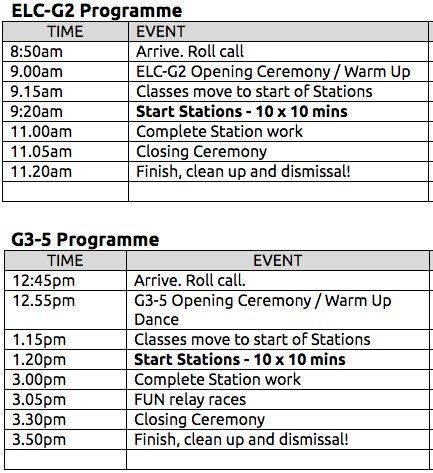 Please note that barring ES Sports Day’s cancellation, there are NO after school activities on Friday after Sports Day with the exception of Aikido or others (music etc) offered by outside instructors.